Health Insurance - An investment in your health. Rising medical costs make health insurance a necessity in today’s market. Olde Fayetteville Insurance & Financial Services has dedicated insurance professionals that will help you find a plan that works for you and your family. Navigating through different plans and new laws can be overwhelming - this is where our advisors can help! Call our office 910-483-6210 for more information. Olde Fayetteville Insurance and Financial Services, Inc. is an authorized agency. At Olde Fayetteville, our ultimate goal is to find a plan that maximizes your health care coverage while staying within your budget. Call us today to speak with one of our experienced insurance agents regarding your health care plan. We look forward to helping you choose the right plan for you and your family! Olde Fayetteville Insurance & Financial Services serves policyholders across North Carolina. Whether you live in Raleigh, Durham, Fayetteville or beyond, rely on Olde Fayetteville for all of your health insurance needs. 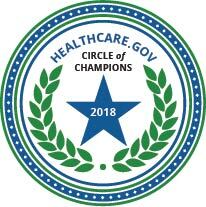 January 2018- Olde Fayetteville Insurance is proud to be a member of the Circle of Champions for 2018 through the Center for Consumer Information and Insurance Oversight. Our strong enrollment with individuals and families through agent Ammie Field earned this award for our office.